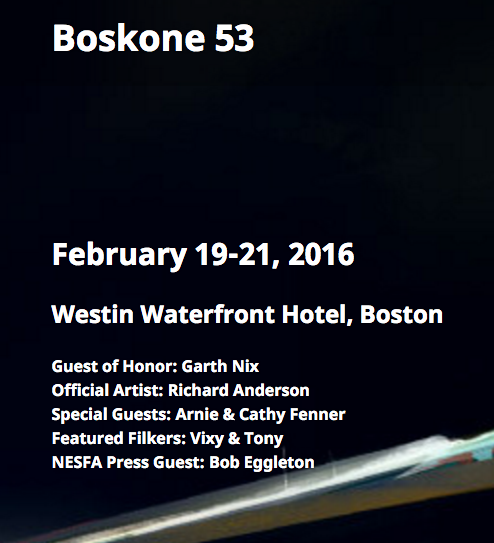 Now the Boskone 53 schedule is out! 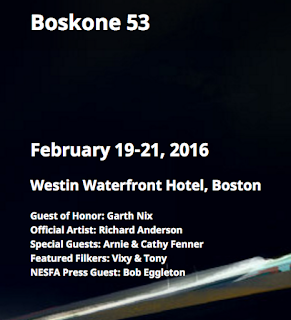 It's February 19-21, 2016 and you can get more information at The Boskone Blog, Twitter, and Facebook. Come and see me on the following panels! If your heart's in the Scottish Highlands, come discuss Diana Gabaldon's Outlander in this, its 25th year. This series of novels and shorter works features elements of historical fiction, romance, mystery, adventure, and science fiction/fantasy. It has spawned a Starz TV series, a graphic novel, and a 14-part song cycle. If you loved the books, how do you think the series is faring? Maybe your introduction to Outlander was through the TV series. How do these two perspectives differ? Why Are Fairy Tales Still Hot Topics? Aesop, Charles Perrault, and the Brothers Grimm have much to answer for. Their fairy tales are integral to the European cultural heritage, and they've spawned novels, films, and TV shows in vast numbers. Why are their stories so compelling? Why do we keep going back to these old collections? Marvel’s film and comics divisions are now under separate management. But differences have been apparent from the first as they expanded the mix of characters and story arcs. From Blade to Iron Man and X-Men to The Avengers — from Pepper Potts to Peter Parker, and Ben Grimm to the galaxy’s most motley "Guardians" — how have your favorites made the transition from panel to pixel, or back again? What elements of the comics should be retained, mixed in, or discarded? How true are they staying to the original source material? And most importantly, for you, which genre is the most pure fun? Art! Poetry! Fiction! Oh my! Some of the most evocative pieces of art and fiction are created in those lovely spaces between the lines. Our panelists share what compels them to create work that lives "off the grid" in many ways. And how do new media fit into or help us burst beyond traditional artforms? Comic books have seen many changes since the first big boom of the 1930s. From the superheroes of the Golden Age to the romance comics of the 1950s and 1960s to today's darker, more complex characters and stories, the landscape always alters and shifts. We've moved away from the Comics Code; indie and web comic publishers flourish. What roles have TV and film played in putting comics on the map worldwide? What's coming next? Can comics maintain the momentum?